Elementary Teacher of the Year Amanda Corbett, left, of Landolt Elementary receives congratulations from last year’s CCISD and Texas Teacher of the Year Jill Howard. The Rotary Clubs of League City, Seabrook and Space Center honored Clear Creek ISD’s 44 Campus Teachers of the Year May 19, at a luncheon at South Shore Harbour Resort in League City, where they also announced the 2014 Elementary and Secondary Teachers of the Year. 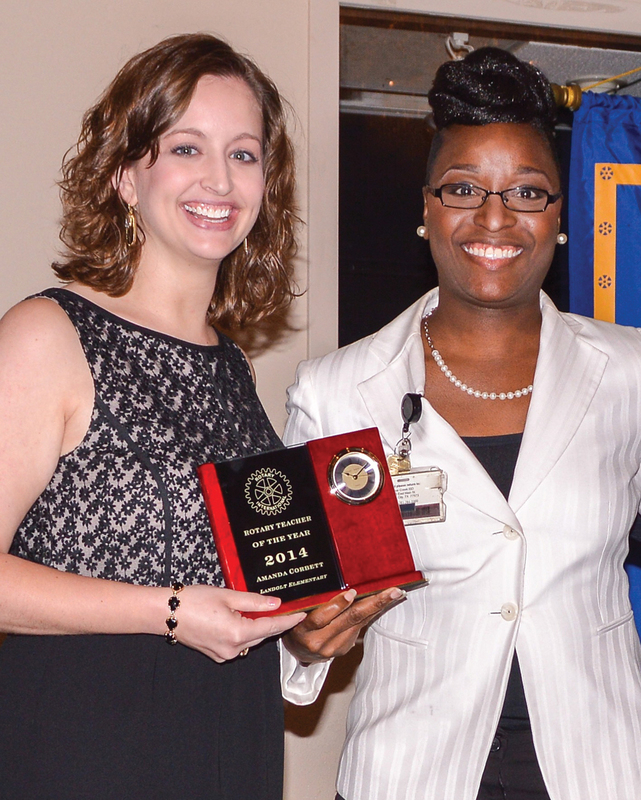 Amanda Corbett, a second grade teacher at Landolt Elementary, is the Elementary Teacher of the Year. In her tenure as a teacher, she has realized the value of relationships, not just with her students, but with her fellow teachers and parents, she said. She views her classroom as a community, recognizing every child has a talent and finds opportunities to put those talents to work. Dave Derr, the Audio Visual Production teacher at Clear Brook High, was selected as the Secondary Teacher of the Year. CCISD said Derr is recognized in Texas as one of the best film and production teachers. Just this year, he led his students to the South by Southwest Film Festival where the Clear Brook High School film and production team was ranked among the top 25 filmmakers in short documentaries. A short film by another student qualified her as a state finalist in the first ever UIL film competition. Secondary Teacher of the Year David Derr, center, of Clear Brook High poses for a photo with last year’s CCISD and Regional Secondary Teacher of the Year, Betty McCulloch, and CCISD Superintendent Greg Smith. Other 2014 finalists were Kelsey Bierman of Mossman Elementary, Erika Montgomery of Ed White Elementary, Dr. Amber Rhodes of Clear Springs High and Jessica Slaughter of Seabrook Intermediate. Both winners will now move forward to the regional and hopefully state selection process for Texas Teacher of the Year. They also received $1,000 from the Rotary Clubs of League City, Seabrook and Space Center.